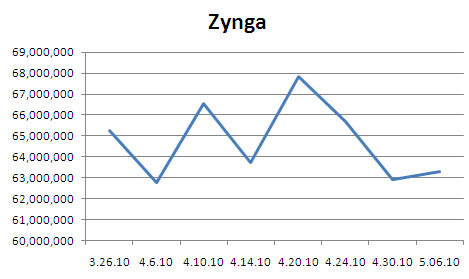 How about Zynga, the king of Facebook? How about EA+Playfish, Crowdstar & Playdom (2nd, 3rd and 4th place behind Zynga, respectively)? 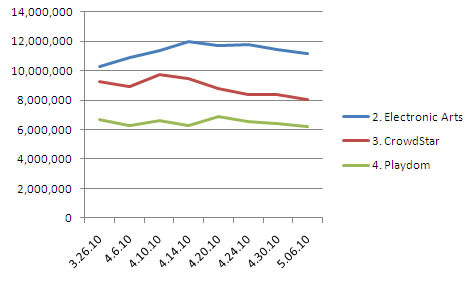 All flat-to-slightly-negative, with the exception of EA+Playfish which experienced a small increase in DAU over the same time period. Coincidentally, Gamasutra and Inside Social Games jumped on this story on Friday (two days ago), identifying the falling active user numbers and blaming the drop entirely on “recent changes in the way Facebook manages notifications.” You should be skeptical about that assertion. While changes to FB notifications may well be having a significant impact, the larger issue is simply that Facebook has clearly entered the inevitable misery phase, which I predicted just a few months ago. The Facebook game development scene has become crowded. Facebook’s platform managers are making decisions that are unpopular with many of their developers and looking to monetize developer activity more aggressively. And the average “hit game” has yet to shift from the “early glory” stereotype to the Facebook game of the future (whatever that might be.) To use a historical example, Facebook is like the MMO market when it was all about Everquest — just waiting for a World of Warcraft to show people what a truly successful social game actually looks like. Of course, Facebook’s WoW won’t look anything like WoW itself, and may not even have a higher development budget than the games launching on Facebook today. It will definitely have a better retention rate, better monetization, and better (less spam-like) viral functionality. Remember all those VCs and pundits saying it’s too late to become a top dog on Facebook? The guys currently choking the halls of one-too-many social gaming summits? To heck with those guys. The next several months (and perhaps longer) are going to be very ugly for the Facebook game development community. Lots of small developers are going to lose money. We may even see a big Facebook developer collapse under the ungainly weight that they have packed on while attempting to bloat their revenues pre-acquisition/pre-IPO. But this phase will end, and when it does, Facebook’s “triumphant return” is going to make XBLA’s triumphant return look like peanuts by comparison. The only question is: who will ride that wave and who will drown before it arrives? PS. 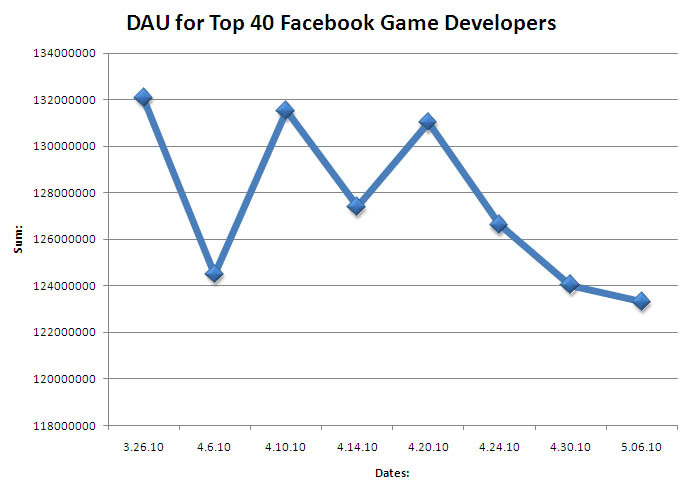 If anyone has access to the complete DAU data for Facebook — i.e. all 200 pages of it — I’d be curious to know if there’s any meaningful evidence of Long Tail activity over the past several months. If there’s anywhere the Long Tail should be manifesting itself, it’s Facebook IMO. Update: interesting to note that on May 7th, around the same time as Gamasutra’s article, Techcrunch revealed that Zynga and Facebook are currently in the midst of a very ugly war and Wired published an article labeling Facebook “rogue” and advocating for a new social standard. Last Friday was truly a nasty start to Facebook’s inevitable misery phase. 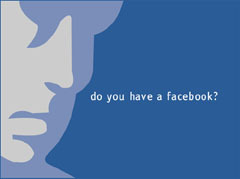 I’ve posted a couple of times about the Facebook “long tail”. Patrick’s comment on that post is interesting — it suggests that the value of the long tail is limited because it’s harder to monetize players if their friends aren’t playing too. Dunno what his evidence for that is, however. What’s awesome is that I profit from option trades using this very principle. I wait look for signals on the daily scale to see that an early glory phase has transpired, usually in a broad market like gold, currencies, the stock indices ect. and then I buy the right to jump in when new highs or lows are made in this mini-trend as the late-jockeys start losing money and the thing pulls back. Then you get the triumphant return and my contract doubles, triples, or sometimes quadruples in value. When it comes to game design, we write our own options. I think there’s potential for niche games to flourish for longer than a couple of quarters if their core design allows a certain kind of player to relate to their friends in a very specific way, a game that provides for a certain kind of “in-joke” if you will, doesn’t have to be a joke but you get me. See the history of Secret Societies if you want some reference material. Then the dev’s job is to try and add things that deepen the system around this tribe dynamic, requiring new things of not just the player (as per most games with their spiraling level design variations) but of the tribe. I happen to be in the mass market business and so instead of thinking about secret societies I think about… uh, societies? Not my most elegant analogy. This will be a hit driven business but indies can benefit the most from the iterative nature of it, not so much the distribution hype. Big companies tend to iterate in terms of, for example, new content that does nothing but mark a holiday, small companies can actually evolve the game into something radical over the course of a year, almost like a sequel within the original. There’s a whole unexplored craft to doing that well. I want to note, Elliot Wave theory suggests what the following phases after Triumphant Return might be like. You’ve got the wave 4 after the big explosion of money, where everything consolidates, get’s choppy, and “complex”. The 1970s were this for the stock market, and some argue we’re in that on a larger scale since 2000 and for the next decade or so. The 1970s also marked that for film, film had expanded it’s scope and entered a “golden age of the autuer”. I see this happening with social games by 2014. That’s where you’ll find the interesting long tail niches. This consolidation phase will last six to ten quarters, including Q1 2010, and whomever can keep it pure and simple while making the social component work with the game (instead of the latter piggybacking on a base-line version of the prior, as we’ve seen in the first stage) will end up creating a public company with a $1B+ market-cap. There won’t be any IPOs for social game companies until the third stage enters it’s strongest inflection. Great post. I agree there’s going to be a ‘triumphant return’ but temper that with the fact that there is also going to be sharp increase in development budgets as people try to spend their way out of the clouds. Not all of them, but just like XBLA or other platforms, budgets can quickly go 10-20X when there’s money to chase.